The following report was released by the Special Inspector General for Afghanistan Reconstruction on September 10, 2013. Reducing corruption and increasing accountability are important components of the U.S. reconstruction strategy in Afghanistan. Since 2002, the United States has appropriated over $96 billion for reconstruction assistance in Afghanistan and, as part of that assistance, has designated numerous programs or activities to directly or indirectly help strengthen the ability of Afghan government institutions to combat corruption. In 2010, in line with a commitment to provide more assistance directly to the Afghan government, the United States and other donors committed, in part, to providing technical assistance to develop the Afghan government’s capacity to reduce corruption. The ability of the Afghan government to deliver services to its citizens without the illicit diversion of resources is crucial to the country’s development and the government’s standing as a legitimate, sovereign authority. Further, as Afghanistan subsequently enters a transformation phase during which it will need to rely on progressively smaller amounts of funding from international donors, it must work to ensure that the revenue it generates is not susceptible to graft and corruption. 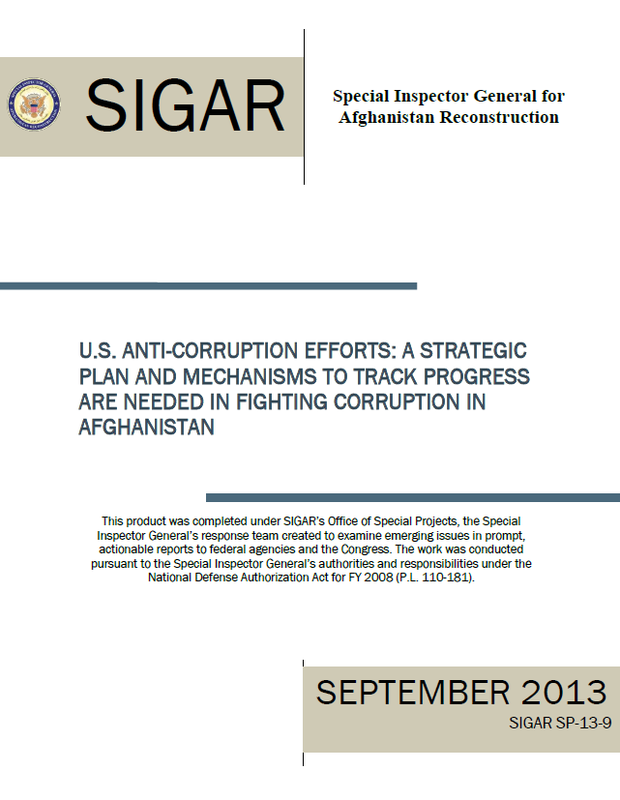 In August 2010, we reported that more than $50 billion in U.S. assistance had been provided for reconstruction in Afghanistan without the benefit of a comprehensive anti-corruption strategy, and U.S. anti-corruption efforts had provided relatively little assistance to some key Afghan institutions. Since that time, an additional $46 billion has been appropriated for reconstruction in Afghanistan. For the Afghan Ministries of Interior and Defense alone, the United States has committed at least $1 billion in bilateral assistance for its security forces and plans to provide more bilateral aid to the Afghanistan government in the future. We initiated this review to follow up on the findings of our 2010 report, specifically on the Department of State’s establishment of a comprehensive anti-corruption strategy and to evaluate the progress the United States has made in meeting its anti-corruption goals in Afghanistan. Our objectives for this review were to (1) identify the United States’ strategic goals and objectives for reducing corruption in Afghanistan and (2) assess the overall progress that U.S. agencies have made against those goals and objectives. We found that the U.S. anti-corruption activities in Afghanistan are not guided by a comprehensive U.S. strategy or related guidance that defines clear goals and objectives for U.S efforts to strengthen the Afghan government’s capability to combat corruption and increase accountability. The Department of State (State) never finalized the draft 2010 U.S. anti-corruption strategy for Afghanistan and, according to agency officials, the draft strategy and its related implementation plan are no longer in effect. In the absence of a relevant and specific anti-corruption strategy, agency officials informed us that two documents guide their current anti-corruption efforts in Afghanistan: the Tokyo Mutual Accountability Framework and the U.S. Civil-Military Strategic Framework for Afghanistan. However, we found that both documents lacked specific goals and objectives with measurable outcomes for anti-corruption activities against which the U.S. government can measure its progress. 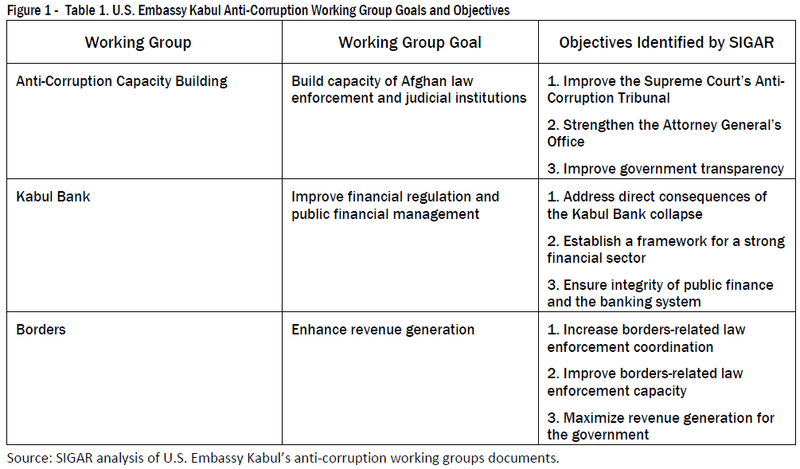 This evidence suggests that the U.S. government lacks a comprehensive anti-corruption strategy that (1) clearly links specific program goals and objectives to the U.S. strategic goals and objectives for combating corruption in Afghanistan, (2) aligns necessary interagency resources to achieve those strategic goals and objectives, and (3) describes the performance measures that will be used to assess anti-corruption activities and their outcomes against the strategic objectives. As the U.S. military and civilian presence in Afghanistan is reduced, U.S. agencies plan to continue to implement programs and activities to increase the Afghan government’s accountability and ability to combat corruption. To oversee these programs and activities, senior leadership at the U.S. Embassy in Kabul made an effort to coordinate the agencies’ various anti-corruption programs and related efforts by establishing three anti-corruption working groups in 2012. These working groups coordinate agencies’ activities under the broad goals of building Afghan government institutional capacity, improving financial regulations and public financial management, and enhancing revenue generation. However, these groups do not measure the medium- or long-term progress of their programs against comprehensive anti-corruption goals. As a result, State and Embassy Kabul remain unable to assess the overall progress the U.S. government has made to improve the Afghan government’s capacity to combat corruption. We are making two recommendations to the Secretary of State to better define and direct the U.S. government’s anti-corruption goals and desired outcomes in Afghanistan. In commenting on a draft of this report, State agreed with the importance of establishing clear objectives and benchmarks in order to measure outcomes. In addition, as a result of our findings, State is developing a targeted set of anti-corruption objectives, benchmarks, and plans against which U.S. efforts and resources will be directed and assessed.